Yes! I said it! Thanksgiving has come and gone, and now we can let our inner elves out of the boxes, bags and off the shelves! As much as I love Thanksgiving, designing for Christmas is so much fun. So while others were scouring the shelves for black-Friday finds, I was siting at my desk, lying in my bed and stretched out at the table sketching up new freebies. I did go out mostly to keep company, and bought myself a hoodie for under $5 (I love hoodies, but I go through them so fast- anyone else?! I’m rough at life, so I regularly rip them, destroy the zippers, stain the heck out of them etc. It’s not because I don’t appreciate or care about my stuff, it’s just that I go at everything in beast mode). Other than that I bought my son the usual pajama sets (he’s 9, and a big fan of PJs), a bag of truffles (not on sale) and that might be it. I don’t need a new TV, I don’t play video games and I have all the creative firepower I can handle for the time being. At home I talked my partner into ordering Hulu for a year at $ 0.99/mo and bought a couple of long-sleeved character tees for my son from Target.com. No lines FTW! All in all I think I came out well. I didn’t haul home a ton of full bags, but I also kept my budget 100% intact. Today’s freebie is from one of those sketches I put together on Friday. I hope you guys like it. It’s 100% hand lettered and drawn by me. Don’t be a stranger- we have so many new designs on the way! 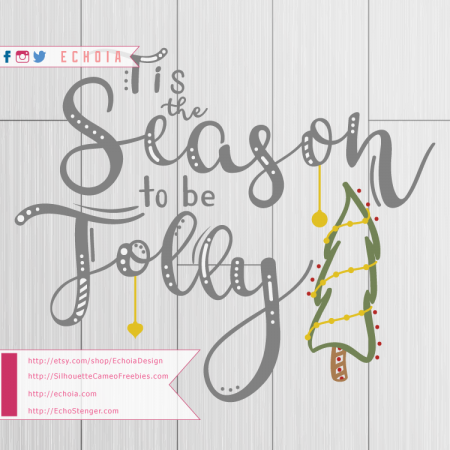 If you are making holiday décor for yourself, cozy long-sleeved tees for your family, or any other personal items, all you need is the free download below. If you’ll be selling or making money with my design, you’ll need to visit EchoiaDesign on Etsy to purchase a license for this file.